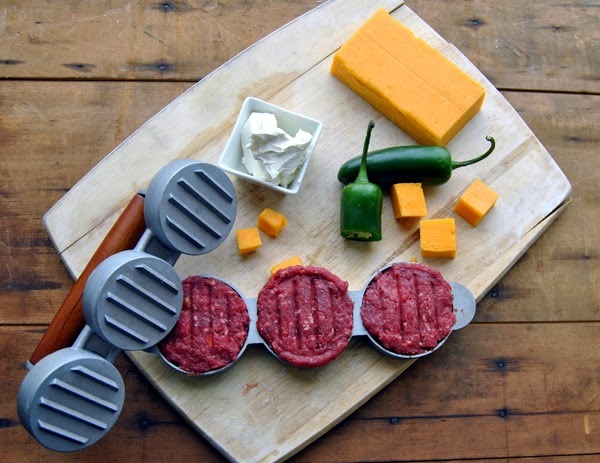 These mini "burger bombs" were inspired by Melt's "Big Popper." Melt Bar & Grilled is a culinary staple here in Cleveland. They're known for their gourmet grilled cheeses, ranging from their Kindergarten (good ole bread & cheese) to their Parmageddon (grilled cheese stuffed with pierogies and kraut). 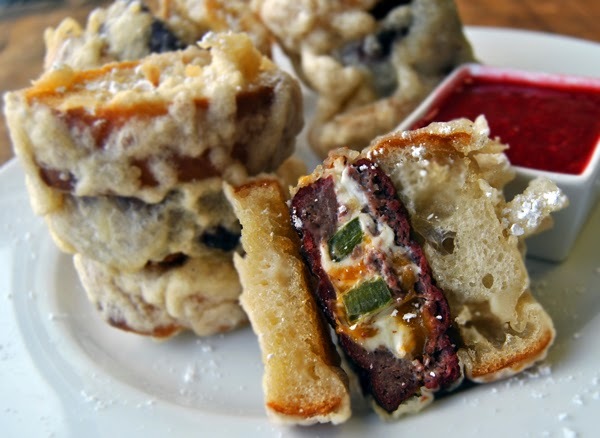 My favorite is their Big Popper: "fresh jalapeno peppers, herb cream cheese, cheddar, crispy battered & deep fried, mixed berry preserves." So I grabbed some venison from the freezer and embarked upon making my own version. 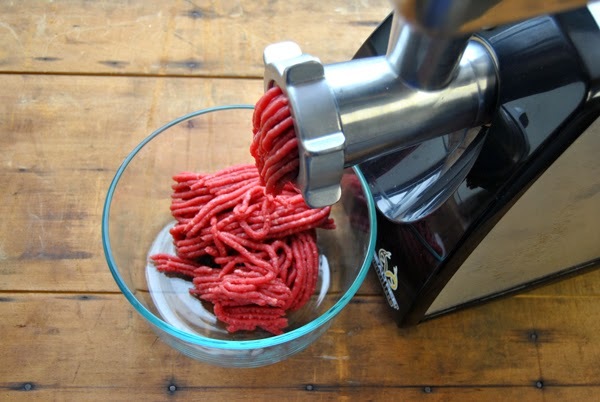 Grind the venison through the coarse plate of your Meat Grinder. Grind again through the medium plate. Then grind half of that through a fine plate. Mix. Place in the fridge. 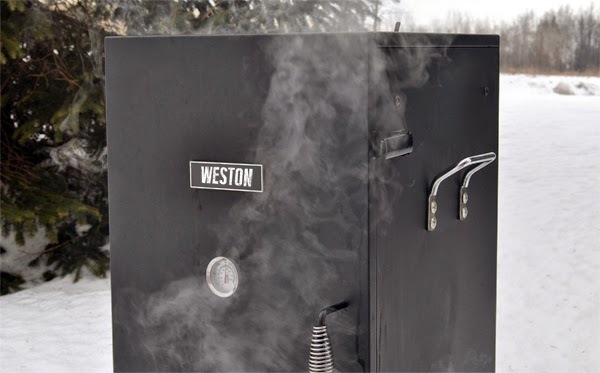 Preheat your Smoker to 160°F, fill the water bowl, and soak your wood chips. Remove the ground meat from the fridge. 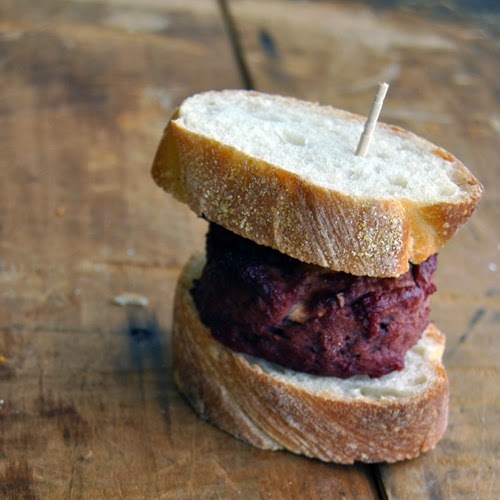 Press a rounded tablespoon of the ground meat into the bottom of each Slider Press slot. Press a jalapeno slice over top of the layer of the meat. Place a teaspoon of cream cheese over the jalapeno. Press a cheddar cheese cube into the cream cheese. Place another tablespoon of meat over the cheese. Repeat for each slot. Cover with the top of the slider press, then press down so that the meat forms a sealed patty. Repeat a second time so that you have six patties. 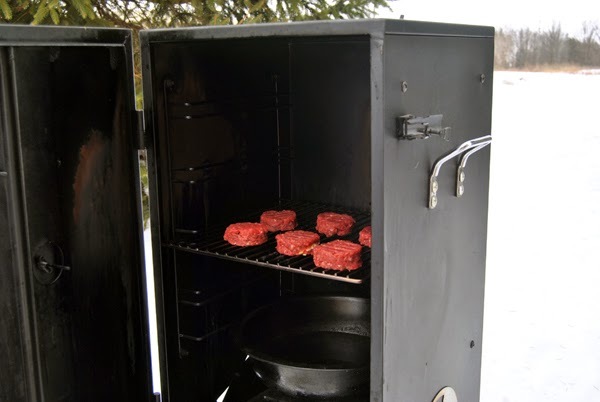 Once the smoker is preheated and the wood chips have soaked 30 minutes, place the sliders onto a rack of your smoker. Smoke 30 minutes, or until the internal temperature is to your liking (130°F med rare, 140°F medium, 150°F medium well, 160°F well) - you will deep fry these, so you may want to undercook them if you'd like them to stay below a certain temperature. Our 140°F degree burgers made it out of the deep fryer medium well, so 10-15°F below your final temp is recommended, but, as always : "use caution when consuming raw or under cooked meats." 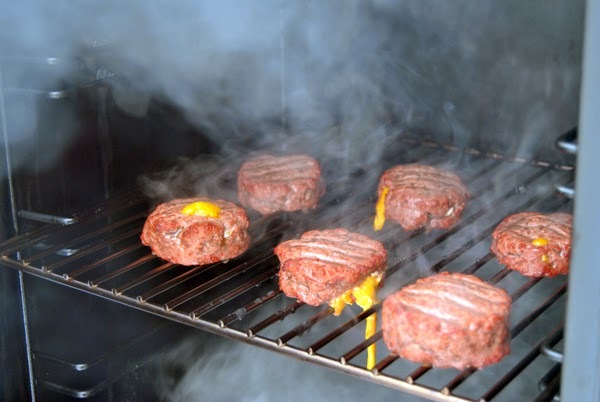 While the burgers smoke, heat your oil to 375°F. You'll need enough oil to fill your deep fryer. You don't have to use a deep fryer (we don't), you could heat oil in a large pot (fill the pot 3 inches) and use a thermometer to monitor the temperature. Just know that this is a more dangerous route to take (the oil may spatter). Puree the raspberries. You can achieve this is a number of ways. We used our Manual Kitchen Kit with the chopper blade. If you don't like raspberry seeds, you could use our Tomato Press with the berry screen. You could simply mash them into a compote. You could also use a Cone Strainer or Food Mill. Refrigerate the puree. Prepare your batter by sifting together the flour and cornstarch. Stir the dry mixture into the seltzer water until uniform. Once the patties are smoked, place them between two thick slices of bread (we sliced the bread to 1 inch with our Meat Slicer & serrated blade). Use toothpicks to secure. Immerse the burgers, bun and all, in the batter. Once thoroughly covered, submerge the burger into the hot oil. You may have to use tongs to flip the burgers, as they tend to float, frying only one side. Deep fry until the batter is crispy, about 3 minutes on each side. You can deep fry more than one burger at a time, it just depends on how much space you have. We used a large pot and fried 3 at a time. Once fried, remove from oil, and set on paper towels for a few minutes to cool, and to drain some grease. 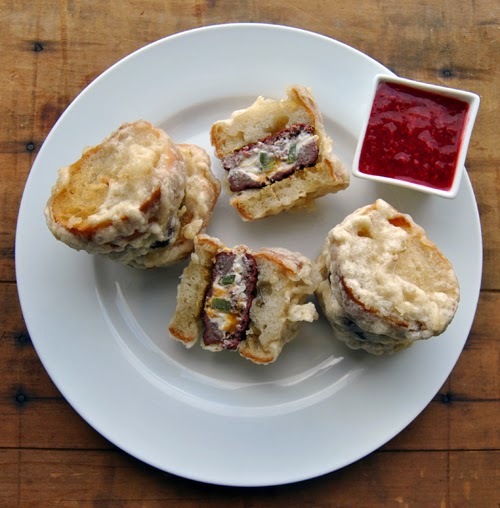 Serve, sprinkled with powdered sugar, and with a side of the raspberry puree, for dipping. Be sure to remove the toothpicks before eating!